It wasn’t the world’s smoothest trip, and the skier ended up doing a face plant at the end, but the video of the whole episode involving the Gophers' rowing team is glorious. *I profess to be good at neither rowing nor water skiing, but I can more confidently profess to never having considered combining the two aquatic pastimes. 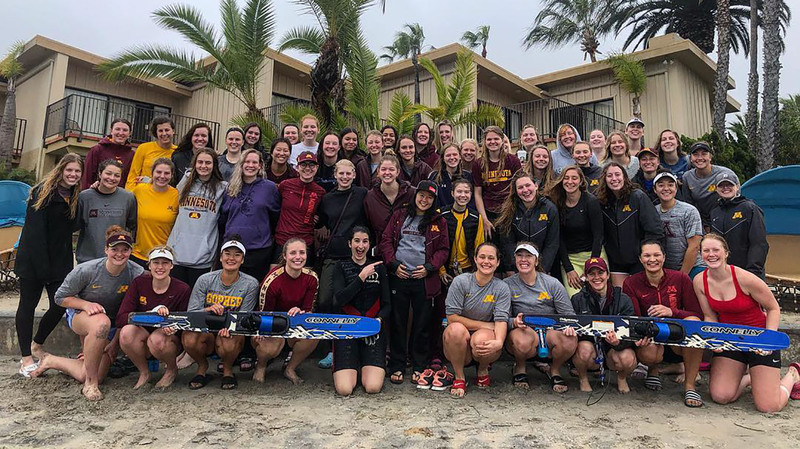 Members of the Gophers rowing team, though, had the brilliant idea — and the strength — to do just that on a recent preseason training trip to San Diego. With team boathouse manager Martha Brummitt waiting behind the eight-woman crew, they proceeded from a dead stop to gain enough speed to get Brummitt up on her skis. Per the team’s web site: Never has this feat been documented by an all-women’s crew, let alone with a woman skiing as well. *The Gophers lost in a heartbreaker at Michigan, but let’s not get too heated about the discrepancy between the clocks. All that matters is whether the ball left the shooter’s hand before the actual shot clock expired — which it did, albeit barely — not if the clocks didn’t perfectly line up. *Related but unrelated: By the way, the aftermath of the Saints loss to the Rams has reached an even more ridiculous stage with the suggestion that the Saints need and deserve a parade. *The Wolves are done with the Suns this season, meaning Gorgui Dieng and Devin Booker will have an entire summer to cool down from whatever was bugging them Tuesday night.